It's been a funny few weeks. The 'come-down' from my amazing weekend in the Netherlands was swiftly compounded by two sick children ("something viral"... at different times... for maximum disruption) and my husband having surgery (he's fine, thank you). This all coincided with annual end-of-term craziness and general festive stress to leave me feeling physically run-down and mentally uninspired. It's nothing new, last year I called it 'Seasonal Overwhelm', and I know it will pass soon enough. In the meantime, I've turned to paper, paint and pens to help get my mojo back. 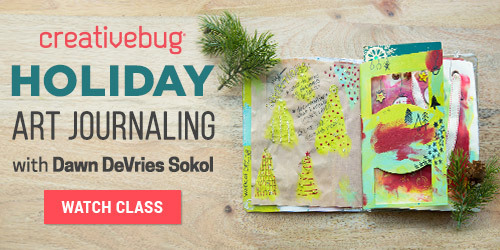 In particular, I've started a new four-part art journaling class on Creativebug*. Little Miss has joined in too - with her own journal and a collection of ephemera from our Christmas box. It's turned into something we can do side-by-side and it should be a fun way to channel the children's excitement over the next few weeks, as well as making a lasting reminder of our 2016 Christmas. 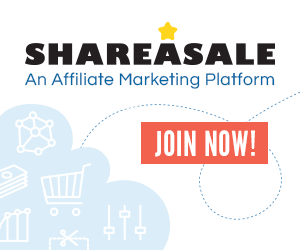 *This post contains affiliate links for Creativebug - images are from the class and used with permission. 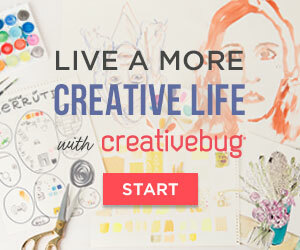 If you're not a Creativebug subscriber already, you can buy the class as a one-off, or start a free month trial HERE which will give you access to this and several hundred other classes. If you are in the US, you will also get a 30% discount at Jo-Ann Fabric and Craft stores for 30 days. 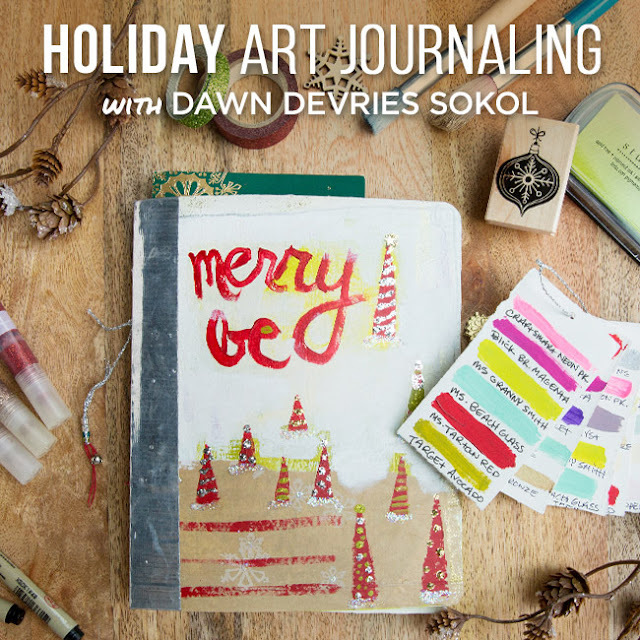 The Holiday Art Journaling class launched just last week, and the first part is called 'Get Your Merry On'. It covers setting up your art journal by creating festive backgrounds, selecting a colour palette and setting your intentions for the season. 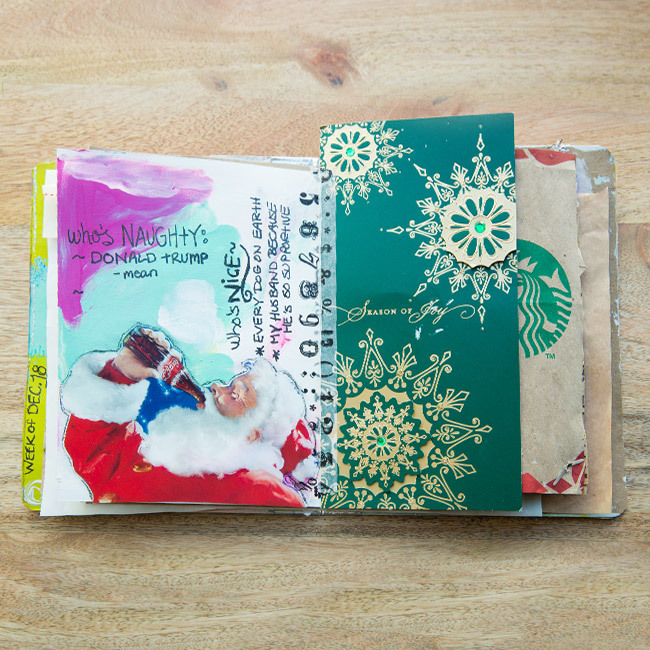 Little Miss was less interested in the prompts and just got stuck in, but if you're new to journaling or just not feeling very festive, this is a great way to focus on what you want to get from the season and documenting it in an art journal. The three remaining classes will be released weekly on Tuesdays, until December 27th and cover collaging with found imagery, adding depth to your pages, doodled embellishments, and how to integrate drawing and lettering with your existing content. The classes will remain online after that period, so you can easily catch up if you come to it at a later date. 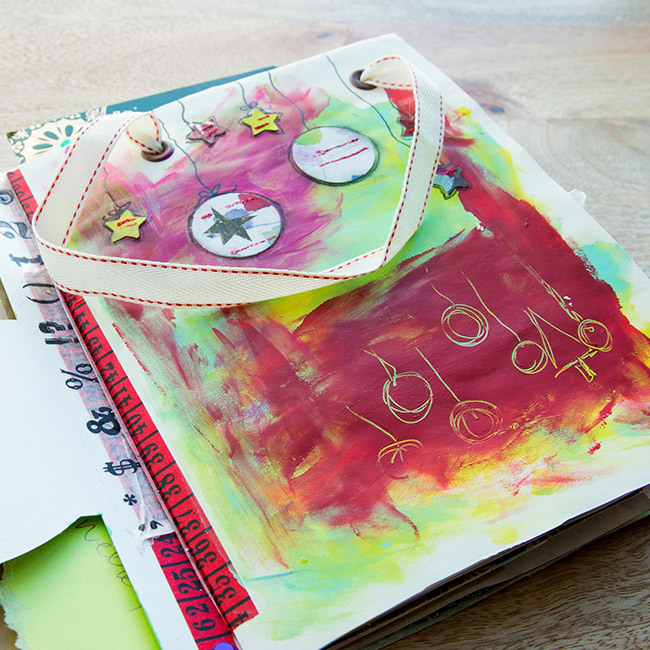 The materials list might seem a bit overwhelming if you're not already into art journalling, but all you really need to get started are some basic drawing materials, glue or tape, random bits and pieces and a journal/book to put it all in. They are mostly things you are likely to have around the house already, or can pick up very easily. Class teacher Dawn uses her own handmade journal but Little Miss and I are both using shop-bought sketchbooks which are suitable for mixed-media. 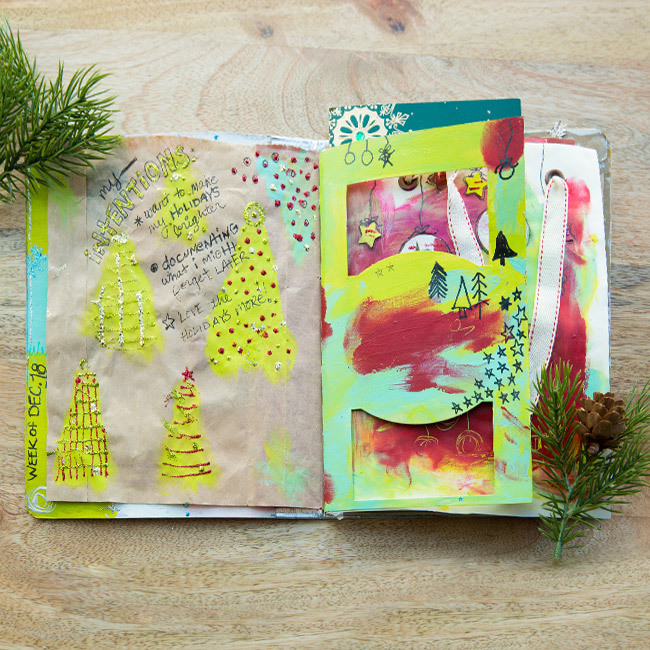 If you want to make your own book, there are a few different class options on Creativebug - including (amongst others) making a mixed-paper sketchbook, Coptic binding and preparing a blank art journal. Find them here. I've joined in with a few of Dawn's different classes now, and the thing I like most is that they are very accessible. You needn't be someone who considers themselves a good artist to get something out of it - it's about the activity itself rather than the finished object - although I think you'll be surprised at how much you like that too. For me, it's become something quite meditative and personal (which is one of the reasons I haven't shared my own images here). Personally, I like to use the prompts as a starting point, and then just go with the flow. Once I get started it's easy to carry on and I ended up filling many pages over the weekend. It's a welcome change from working on blog posts or knitting designs as it's about the process. As no one will need to see what I've done, there is absolutely no pressure for it to be a certain way or to look 'good'. It's actually very liberating. If you (and / or your family) would like to give it a try, use the link below to start the first class right now. If you get carried away and can't wait for future instalments, you might also like this class from Dawn which includes a whole month's worth of daily prompts. You can share your work on Instagram if you would like to, the hashtags are #cbugholiday and #cbugdrawaday. 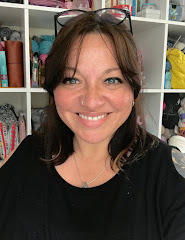 I'll be back later in the week with some more festive crafting and the latest in the Festive Gift Guide series. See you soon!